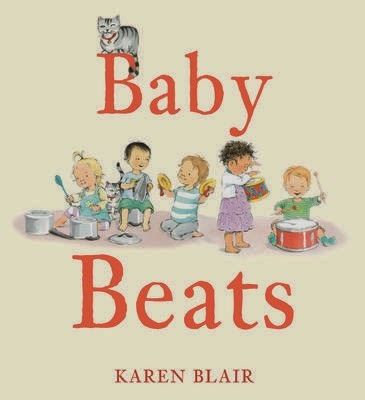 Baby Beats was written and illustrated by Karen Blair, and published by Walker Books Australia (2014). I’m going to be running Storytime at my local library soon, so I'm eagerly seeking out the very best read-alouds for pre-schoolers. Baby Beats has gone straight into my book basket! It’s perfect to share with kids because it has lots of opportunities for movement and noise-making. Let s play music, make a beat. Clap your hands and stamp your feet. This is a vibrant picture book feature beautiful illustrations by award-winning author/illustrator Karen Blair. Karen has used a combination of language and sounds to create a simple story that will engage younger readers. Baby Beats is a companion title to Baby Animal Farm (2012). Baby Beats spoke instantly to my inner child and had my toes tapping and fingers flicking. There are no stumbles to the rhythm, and it’s so easy to read, children will be joining in very quickly. I can also see them “pretending” to read it aloud to anyone who will pause a while to listen. This delightful children's picture book deserves a place in every community library. Pre-school and even Kindergarten teachers will grab it to introduce instruments to kids, and share the great sound words. But it shines as a great children’s picture book for those wriggly rascals who need to be up and doing while they enjoy their books!